Get a feel for what we do, take a look at the Working Week video....it starts around 12 minutes in. Two spacious classrooms, in a self contained studio with separate kitchen, coffee room and ample private parking. 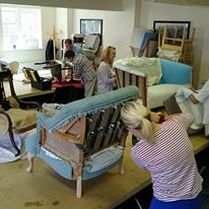 Our studio offers a range of courses and workshops in fashion and interiors including City and Guilds Acredited at Foundation level. Tutors looking for an inspirational teaching space are welcome to enquire.